What is the Best Season for Fiberglass Pool Installation? Fiberglass pools have many benefits over concrete and vinyl liner pools. Fiberglass is low maintenance, quick to install, uses fewer chemicals, has a smooth finish, is extremely durable, and has an attractive and elegant look. Because of all of these benefits, you may want to have a fiberglass pool installed at your house. One of the questions that people often ask is when they should have their fiberglass pool installed. Another benefit to these pools is that they can be installed year-round, regardless of the climate or weather conditions where you live. Is drowning really an issue? Yes! I know it's easy to think, "That only happens to other people." We get lazy. We make assumptions. But this is the absolute worst time to learn what they say about people who assume. Drowning kills children under 5 years old more than anything else besides birth defects. About 1 in 5 people who die from drowning are children 14 and younger. For every child who dies from drowning, another 5 receive emergency department care for nonfatal submersion injuries. We can prevent these tragedies by knowing both how to prevent potential issues beforehand and what to do if an accident does occur. Pools are party central, basically by nature. They're a great opportunity to win over your grumpy neighbors or spend quality time with your extended family. And, bonus, they offer a reprieve for awkward guests like me, who answer three questions about writing or work and then hide behind the refreshments table for ten minutes. Here at River Pools, we've learned that pools bring people together like nothing else. We specialize in fiberglass pools, but we're here to help you regardless of whether or not you buy a pool from us. Whether you have 3 guests or 30 (which seems like a lot to me, but still), we want to help you make the most of this bonding experience. And it's so satisfying to pull off a successful party! Should I Get a Fiberglass Pool? Considering a fiberglass pool? Every pool type has its advantages and disadvantages, and these are no exception. Weird, I know—a fiberglass pool manufacturer is saying that? Out loud? (Well, metaphorically out loud.) Yeah. At River Pools we believe pool buyers should have all the information, regardless of whether you buy a fiberglass pool from us. So we're going to go over the things you should know about fiberglass pools, both good and bad, so you can make an informed decision on whether or not it's the right choice for you and your family. We can all admit that, back in the day, fiberglass pools used to be a bit of an eyesore. But science is an amazing thing: the technology has developed so that not only are these pools now gorgeous, but you can find the exact design and accessories to create your dream backyard. We at River Pools take nigh-parental joy in creating fiberglass pool shapes and designs to fit all kinds of needs. Disclaimer: The shape and size of fiberglass pools can’t be customized the way concrete or vinyl liner pools can. A, they’re built from existing molds, rather than from scratch. B, they have to be 16 ft by 40 ft or smaller, since they travel via highway to get to your house. It’s sad, I know. However, that’s not to say you have no choices! There are plenty of options available, and every fiberglass pool manufacturer produces different designs. Most people are able to find a fiberglass pool design that they love and that fits their needs. Sometimes it’s time for a switcheroo. I’ll reorganize my nonfiction bookcase, or my mom will plant new flowers around her house, or my cat will suddenly start sleeping on a new corner of the sofa for no reason. You might have reasons behind it, or you might just feel like a change. Maybe for you—whether for money, maintenance, or just a plain ol’ change of pace—your vinyl liner pool is the subject of that change. At River Pools we manufacture and install fiberglass pools, and several times each year, we replace vinyl liner pools with fiberglass units. Our clients are thrilled with the results, and with fiberglass pools gaining market share every year, we expect to take on more and more of these replacement projects. Lifespan matters for just about everything. As an exotic pet owner, I check how long a snake breed is expected to live before adding that snake to my menagerie. As a laptop buyer, I check user reviews for the real-time battery life before purchasing that model. So how long will your fiberglass pool last? We say “Don’t drain your pool.” Then we say, “At some point, every pool will need to be drained.” So, fiberglass pools: to drain or not to drain? That is the question. Yes, I know this Hamlet-style pondering can be confusing. But are we contradicting ourselves? Not quite. To keep your pool living its best life, don’t jump on the drain train. Problems can happen if the groundwater around an inground swimming pool is higher than the water in the pool, no matter what type of pool it is. Will My Inground Pool Fade? If you're considering an inground pool, you're probably wondering what the pool will look like in 5, 10, or even 20 years. At River Pools, we've been around a while and understand how the different types of inground pools weather over time…specifically, when and how the surfaces of inground pools fade. When you're considering a pool for your backyard, you have big decisions to make. Here at River Pools, we aim to provide informative, all-inclusive content to answer your questions about inground pools. Even if you don't choose our fiberglass pools, we want you to know you've made the best decision for your family! In our blog and our videos, we've created content to help you walk through the three main choices: Is an inground pool right for your backyard? Is a fiberglass pool the best option? Who is the best manufacturer? Are you considering an inground pool or, more specifically, a fiberglass pool with an integrated tanning ledge? Are you a fiberglass pool installer looking for best practices regarding tanning ledge pool installations? If so, you're in luck! Today we're going to share our system for installing tanning ledge pools—and reveal our unique manufacturing process to ensure your tanning ledge pool is super awesome. Let's dive right in! How Do Osmotic Blisters Form on a Fiberglass Pool? Double double, toil and trouble / fire burn and gelcoat bubble… Wait. Why are there bubbles in my pretty, pretty fiberglass pool gelcoat? How did they get there? Who can I yell at about it? First of all, don’t yell. It’s not nice for anyone. Second, let’s take a chill pill and discuss these bubbles—osmotic blisters. Time for a shout-out to the unsung heroes: pump and filter systems! Your pool pump circulates the water to distribute the chemicals and filter out particulate matter from the water to keep the water clean, pretty, and safe. It’s doing you a solid, but it can also be a giant energy hog thanks to all that work. (Plus, extended hard work could wear the pump out sooner than expected. We don't want that. After all, extended hard work is the worst.) So how can you get all the benefits without spending extra money on electrical costs you don’t need? How Is the Thickness of a Vinyl Liner Measured? Looking for the perfect vinyl liner pool? You’ll eventually have to choose the vinyl liner part of that. Color and design, of course—but how thick are the different pool liner options? How do the manufacturers measure it? What does the measurement mean in normal people terms? We recommend cartridge filters for fiberglass pools with salt water systems. They work the best and are easy to clean. Ever notice how some people insist on using a $5 word when a 10¢ word would suffice? (I know I just used the word “suffice,” but hear me out.) The first time I heard the phrase “exposed aggregate” for a pool finish, I thought it was a pretentious way to say “Pebble Tec.” But it’s actually the correct term. Not all exposed aggregate pool finishes are products of the Pebble Tec company. Exposed aggregate finishes are sometimes called Pebble Tec in the same way that we often call tissues Kleenex—one brand has become representative of the product. So we’re going to talk about exposed aggregate finishes as a whole. You know that feeling when you have so much to do that you end up just binge-watching Netflix instead of doing anything at all? Pool research can feel that way. What should I search first? What should I search for? If it’s your first time looking into all this stuff, it can be overwhelming. There’s a lot of information, and somehow you’re supposed to figure out how to navigate it all. How are you supposed to know what you don’t know? Well, fear not. I’m going to give you a super quick rundown of the most common questions—and links to learn the answers. Boom. It doesn’t get much easier than that. Does My Pool Need Winter Maintenance? The joys of summer: pools and convertibles. My best friend has a red Mustang convertible named Sally (i.e., Mustang Sally). In the summer we love to drive with the top down to get Slurpees. However, with a heavy heart, she has to cover Sally up for the winter. Likewise, you should bundle up your pool during the chilly months. We know it’s a sad day. We won’t judge if you cry a little. When I’m not taking the pool industry by storm, I like to write novels. I plan ahead obsessively: think 10-page character sheets, hand-drawn world maps, and color-coded plot diagrams. “Congratulations on overthinking everything,” you say, “but I’m not writing a book. I’m buying a pool.” Don’t give me that look! For pool purchases and maintenance, you, too, need to plan ahead. Maps and diagrams included, probably. Are Trowel Marks on Your Pool Inevitable? Don’t you hate when you’re trying to smooth frosting on a cupcake and it keeps showing the dents from the spoon or knife? If you know how to do it right, tell me your secrets. Bakers must have sold their soul to figure out the magic trick for that. Sure, the cupcakes taste the same either way, but it just looks so much better when they’re smoothly swirled. Welcome to the world of trowel marks on a pool. Gunite vs. Shotcrete: What’s the Difference? Concrete pools are often referred to as “gunite” pools, but then what’s shotcrete? Are gunite, shotcrete, and concrete all the same thing? Not to worry… all will be revealed. (Doesn’t that sound ominous? I love it.) Quick refresher: concrete is a mix of water, cement, sand, and a coarse aggregate, which is usually stone or gravel. The cement, sand, and aggregate are the initial mixture. How the builder mixes in the water determines how we refer to it. Odds are, you’ve heard pool people tell you, frantically and with tears in their eyes, “Don’t drain your inground pool!” They mention hydrostatic pressure as the reasoning before running off to warn the next pool owner they can find. It’s nice of them to alert you…but what are they talking about? Why shouldn’t you drain your pool, really? What does “hydrostatic” even mean? Not to worry, friend. I have your back. Let’s talk pool physics. How Late Can I Install a Pool Cover? If you’re new to the world of pool ownership, get ready to use your Surprised Face… You don’t have to have a pool cover. I always got the impression that you did, but it’s actually not required. The obligatory fence around the pool area is your first line of defense in the safety arena. Let’s be honest: we all like to seem super skilled and smart. My personal tricks include: Reciting all of “Beauty and the Beast” from memory Counting on my fingers how many novels I’ve written, using dramatic pauses Using the phrase “nonlinear progression of time” (I may not be much fun at parties, now that I think about it.) Anyway, my point is, here’s a topic that you can try out for yourself: science! Science may not be your specialty, but you can impress your neighbors if you casually explain some chemistry to them in precise scientific terms, so it’s worth a shot. When Should I Close My Pool for the Winter? I have zero tolerance for the cold. My family teases me for my wimpiness. I’ve accepted it. Most of us have been around vinyl liner pools at one time or another. (For example, my grandparents have one. I now know that they needed to replace the liner years ago. Don't blame the grandkids for rusted wall panels, Nana.) But personal experience doesn't necessarily mean someone knows the details. Curious about the basics? Here at River Pools, we worked exclusively with them for years before we discovered and fell madly in love with fiberglass pools. We’re all about making information available to you and easy to understand. That includes all types of pools. Are Deep End/Diving Pools Really a Good Idea? How Thick Should a Concrete Pool Be? What’s the best concrete thickness for your pool? If you’re asking this question, you’re probably already looking at and comparing the pool contractors in your area. The vast majority of us can’t DIY a concrete pool; the process is too complicated and technical. You’ll contract professionals to engineer and construct it. Be sure to ask them the relevant questions we lay out in our Swimming Pool Builder Vetting Checklist to confirm their integrity and expertise. Time for a radical statement: fiberglass pools aren’t for everyone. I know! Contain your shock! River Pools manufactures and sells them, but our priority is one thing: customer satisfaction. We want you to be informed so you can make the best decision for you and your family...even if that means not choosing us. Planning a new vinyl liner pool and unsure what to do with the floor? Although River Pools now specializes in fiberglass pools, we started out working only with vinyl liner pools, and we want to share our knowledge so you can make the best decision for you and your family. If you’re planning to buy a concrete pool, have you ever wished you could time-travel to the future and see what the construction process is like? Time travel is, of course, the best solution to any question, but in this case we can provide answers without it. Based on our experience, people usually assume that replacing a concrete pool with a fiberglass pool will be cheap—maybe as much as replacing the liner twice in a vinyl liner pool, or resurfacing a concrete pool. I like a clearance sale as much as the next person, so I’m sad to say this isn’t the case. It can actually end up costing more than a new pool. I know; it hurts me too. Here’s why it’s expensive even though you already have the pool-shaped hole in the ground—and why it may still be worth the cost. Green: the lovely color of freshly mowed grass, summer leaves fluttering in the breeze, and the protagonist’s eyes in any teen novel in the local library. It’s not so lovely when it’s the color of algae in your inground pool. Here at River Pools, we care about your skincare routine. Well, for your feet. What's the Best Concrete Pool Design for Your Needs? Every pool owner has different goals. This affects the design—pools don’t have to be (and shouldn’t be) one-size-fits-all. You can customize concrete pools to fit almost any look you like, which is a huge advantage for this pool type. However, most don’t vary that much. Are Tanning Ledges on Vinyl Liner Pools Really a Good Idea? Pools aren’t always for exercise, so why should they all be designed as if they are? Whether you’re building the pool yourself or contracting it out, you need to know the differences between the material options for your wall panels. It’s only the second step in the construction process, too, so you can’t make much progress until you decide. And this decision will be with you for a long time. Ah yes, the relaxing rush of a waterfall. Such a beautiful, soothing noise…until you remember that you’re sitting by your pool and didn’t install a waterfall. Yikes. What is a fiberglass pool, in the most basic sense? How much will my vinyl liner pool cost? What do I need to budget for? You’ve already asked yourself these questions—you know that buying a pool is a big financial decision. You don’t need us to tell you that. River Pools aims to provide you all the information so you can make the best decision in your pool search. We suggest ways to make your pool project more affordable and provide a pricing guide for all three of the major inground pool types. Now we’d like to help you budget by providing an overview of the areas you should take into account when planning your dream backyard pool: the factors for both initial and lifetime costs. If you decide to go with a vinyl liner pool, we won’t cry…much. (River Pools specializes in fiberglass pools, after all.) But that vinyl liner needs some special attention in order to live its life to the fullest. While the builders and installers are responsible for creating your pool according to specifications, you have the power to ensure that they do so and that your pool stays in good health for as long as possible. One way to do that is to understand how to prevent divots, dents, and bumps in the bottom of your vinyl liner pool. Interested in a concrete pool, but concerned about staying within budget? At River Pools, we sell fiberglass pools, but we know that in some situations, concrete pools are a better fit. 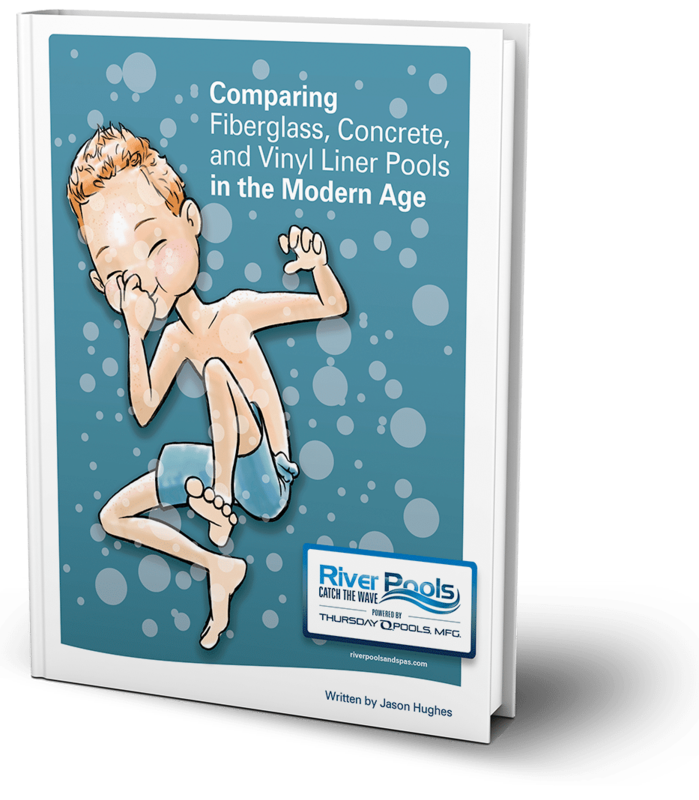 Vinyl liner, concrete, and fiberglass pools all vary in cost, but each type has a certain range. In order to make a fully informed decision about your concrete pool purchase, you need to know the cost of ownership both up-front and in the future. Are you in the market for a concrete pool? With so many pool types and companies available, it can be difficult to find unbiased, thorough information. Here at River Pools, we sell fiberglass pools exclusively, but we understand a fiberglass pool may not be the best fit for everybody, and many pool shoppers might find a concrete pool to be the best option for their situation. However, concrete pools comes with their own unique set of problems, and because a pool installation is such a big decision, we want to ensure you have the full picture. Here are 10 of the most common problems for a concrete pool—and how you can avoid them. If you are looking to build an inground pool, you may be excited about the prospect of adding this new feature to your outdoor space. A pool can provide you and your family with many benefits and hours of fun. However, while playing in a pool can be fun, building one is another story. There is a lot of research and work that needs to go into planning the pool. You need to ensure that you purchase the right pool and layout so you are happy with your decision for years to come. Many factors come into play when designing and selecting a pool. This includes items like size, color, type, and design. Here are a few of the things you need to consider when you are buying a pool. They will help you hone in on the pool size, shape, type, and design that best meet your needs. Buying an inground pool is a major purchase. They cost tens of thousands of dollars and can affect both the aesthetic of your outdoor space and the value of your home. This is a purchase that you should never take lightly. There is a lot of research that you need to do before buying one and a lot of decisions that need to be made. If you leap in without doing your homework, you could overpay, purchase a pool that requires more maintenance than you prefer, or hire the wrong contractor for the job. Doing your research can help you make educated and informed decisions about the type of pool you buy and its features. All in all, this helps ensure the pool not only looks amazing outside your house, but has the features and functions that make sense for you and your family. If you are installing an inground pool, you are likely excited about the prospect of being able to swim and play in the pool when you want. However, when people purchase a pool, they have an idea in their head as to what their space will look like. It may be green and lush, or it may be exotic and tropical. Regardless, the pool alone will not make your vision a reality. It is the landscaping around the pool that helps everything come together to give you the outdoor space you have been dreaming of. Choosing a look or theme will help you decide what type of landscaping to place around the pool. As a current pool owner or someone who is looking to purchase a pool, somewhere along the way, you may have asked yourself, what's the difference between a salt water pool and a chlorine pool? Which is better? Should I get a salt water generator for my swimming pool? If you're in the market for an inground pool one of the first questions you're likely to ask is, "How much should I budget for my pool?" In the following video, we discuss the installation prices of the three types of inground pools: concrete, fiberglass, and vinyl liner. We also discuss the long term cost and price to own each type of pool over a 10-year period. Greco Survey Results Are In: Real Feedback From Real Customers! One of the things that keeps business fresh and exciting for us here at River Pools is our desire to constantly improve. We have found this requires getting into the mind of our clients—to see our brand, our products, and ultimately the overall experience that we provide from the perspective of our customers. We recently conducted a survey of our clients who purchased our Greco (G36) pool, and the results were so compelling I thought it would make good food for thought for those trying to decide which pool model is right for them. Are you losing water in your fiberglass pool? Perhaps you've scanned the pool surface and cannot find any damage to the pool shell so you're wondering where to turn next. On hot days where the temperature has you sweating and thirsty for a cold drink, there aren't many things as refreshing as jumping into a cold pool. A pool is something you want to enjoy when it's hot outside. However, many people don't consider that their pool water can reach temperatures in the 90s during the summer. Pool chillers, an optional feature on pool heat pumps, are specifically designed to lower your pool's water temperature so you can fully enjoy it, even on the hottest days of summer. In the following video, I show just how big the difference can be when you have a chiller/cooler installed on your pool. Will I Need An Electrical Service Upgrade For My Swimming Pool? Of the roughly one hundred inground pools we install each year throughout Virginia, Maryland, and West Virginia, we encounter several that require upgrades to the home's electrical service. Today, we're going to answer some of the common questions we receive about how a swimming pool may influence whether or not you will need to upgrade your electrical service. 4 Swimming Pool Construction Questions...Finally Answered! Are you in the market for an inground swimming pool? If so, we at River Pools understand that this can be an overwhelming process. Initially, when shopping for a pool we encounter what seems like a never-ending flood of budget, design, and construction questions. Furthermore, It can be difficult to find credible and unbiased information. Well, today you're in luck because we are going to share our answers to common swimming pool construction-related questions that hundreds of our inground pool clients have asked over the years. Swimming Pool Design Guide: Friendly Advice From A Pro! Are you looking for inspiration for your new backyard pool? Awesome! After helping hundreds of folks in Virginia and Maryland design and build their dream pool over the years, we would like to help you get your project off on the right foot. But if you're like most people, the prospect of finding the perfect pool can seem daunting. Well, you're in luck, because today we're going to walk you through a simple step-by-step process to finding the right pool shape, size, and features for your backyard space. Let's jump right in! River Pools has installed over 1,000 inground fiberglass pools throughout Virginia and surrounding areas since 2001. We have worked in a wide variety of soil conditions, ranging from coastal areas that are literally below sea level, to mountainous regions engorged with bedrock. As such, we have had to learn to deal with both high water tables (ground water) and the removal of rock for the installation of our pools. If you are considering an inground pool, you likely have a myriad of questions regarding how water and rock can influence the construction of your project, and whether the soil condition should impact which type of pool you purchase. Today, we're going to tackle these questions and hopefully give you the information you need to feel comfortable moving one step closer to owning your own backyard pool. So let's jump right in! Are you thinking of installing a pool in a yard with trees? We've surveyed hundreds of yards in VA, MD, and WV for inground fiberglass pools over the years, and we've encountered many different tree scenarios. We'd like to share our experience with you today. Here are some common tree questions we are going to answer. When we first began installing fiberglass pools in the early 2000s we encountered our share of problems. Despite the fact that we fixed each one and made sure every customer was happy, we were still left asking the question: What went wrong? Many of these issues were leaks that developed in the plumbing of the pool or in the fittings that the plumbing was connected to. In the following video we explain our process, called The River Pools Way, that we developed specifically to eliminate these plumbing problems along with the other challenges associated with fiberglass pool installations. What is The River Pools Way? Valid question, so here's the thing: an inground pool is a huge investment. And unlike a new car that you could simply return if things go awry, once a pool is in your backyard...it's your baby. That makes both the quality of the pool and the manner in which it is installed extremely important. Is Sand or Stone Better Backfill for an Inground Fiberglass Pool? If you are considering an inground swimming pool you probably have a lot of questions about how they are constructed. Before we get into the following video that covers a key component of fiberglass pool installations, let me introduce you to our FREE inground pool ebook that goes into great detail regarding the installation processes of all three types of inground pools: Concrete Pools, Vinyl Liner Pools, and Fiberglass Pools. I'll be completely honest...At River Pools we have made just about every fiberglass pool installation mistake possible. Whether you are a pool builder or a home owner, it's important to understand that the process of building a fiberglass pool on a home under construction presents some unique challenges. However, if these are understood and discussed beforehand they can be easily overcome. Can Water Behind a Fiberglass Pool Cause Osmotic Blisters? If you are looking for information about how fiberglass pools are manufactured, you have come to the right place today! Being a manufacturer of fiberglass pools, we receive lots of questions on a daily basis about the materials we use, how they are applied, and how they perform in the field. If you are considering an inground swimming pool and have a realistic expectation of how much it will cost, the next step is to explore the various pool financing options available to you. Here at River Pools we have had the opportunity to help hundreds of clients make their backyard dreams a reality, by not only manufacturing and installing their pools, but also by helping answer their questions about pool loans and financing and directing them to financial institutions that can best serve their needs. If you find yourself in need of more pool financing info, you're in luck because today we’re going to answer the most common questions we receive about pool loans. Let's jump right in! If you are considering an inground pool and have limited space to work with, you're likely thinking that a small pool could be the way to go. Today we're going to discuss some of the major questions we receive on a daily basis here at River Pools from folks who think that a small pool might be the best option for their backyard. Let's jump right in! What Are the Dimensions or Sizes of Small Pools? We consider small pools to be up to 26' long and up to 12' or 13' wide. If this is too small for you, perhaps a medium pool (up to 34' long and 14' wide) would be a better fit. Then there are always large pools, which can be 40' or even longer. After years of working with hundreds of inground fiberglass pool customers we have found that our clients research several key factors when preparing for their project: cost and pricing the amount of pool maintenance required how long they can expect their fiberglass pool to last Today, we are going to discuss the latter, and share with you what we know about the durability of inground fiberglass swimming pools. So let's get started! Have you ever wondered how an inground fiberglass pool is created? Let's see the 3-step process to making a fiberglass pool from scratch: The production of the pattern or "plug" The production of the mold The production of the pool shell The video shows the "birth" of our first Oasis 27 (O27) pool from the mold. How Are Fiberglass Pool Molds Made? As one of the leading manufacturers of fiberglass pool shells in America we get asked all the time, “How do you create a new fiberglass pool design from scratch?” It’s a question we love answering because it’s a fascinating process and we honestly feel that the more informed the consumer is about the product they are buying, the happier they will be with it in the end. With that said, there is a three-step process in the creation of a new fiberglass pool design. 3 Steps to Creating a New Fiberglass Pool Design The Pattern The Mold The Pool This is a very detailed process that we can’t cover entirely in this article, but we can give you the basic concept behind the first two essential steps, constructing the pattern and producing the mold. If you are in the market for a rectangular fiberglass pool, you’re probably wondering which design will best meet the needs of your family. After working with hundreds of fiberglass pool customers since 2001, we’ve basically found that there are five factors that influence which rectangular pool design might make one option a better fit for your family than another. We're going to discuss each of these elements in this article, so here goes! Don't Believe Concrete Pools Are a Maintenance Nightmare? Watch This Video! Of the hundreds of questions we are asked on a daily basis, the most common is probably this: "What are the differences between concrete and fiberglass pools?" It's a great question and there are many differences, but there's one in particular that fiberglass pool owners love to talk about: fiberglass pools are extremely low maintenance. We have written a blog on this subject a few years ago, and after visiting the Pool and Spa show in Atlantic City I felt that the topic needed to be revisited. I had heard that some fiberglass pool manufacturers who also have vested interest in vinyl liner pools manufacturing are requesting that their fiberglass pool dealers install vinyl liner pools also. I have no problem with that as long as the sales person keeps the customer's best interest in mind when working with them. I have installed vinyl liner pools myself and under the right conditions, I would do it now. What Are the 3 Most Popular In-ground Pool Options of 2019? As a pool guy, I get asked all the time, "What are the most popular options for in-ground pools and why?" I would say the three most popular options are salt water chlorinators, underwater pool lights, and security covers. Here are the pros and cons of each. Variable Speed Pool Pumps vs One and Two Speed, Which is Best? If you are considering a new pool or even replacing your existing pool pump, you're probably wondering which type of pool pump will best meet your needs. Great question! When we started River Pools and Spas 14 years ago we were like any other pool company and if you asked for it we sold it to you. But we have learned that the customer can be their own worst enemy. What I mean by that is buying a pool is usually a new experience for the home owner and with the right guidance they can end up with a pool that will best suit their family. What the concrete/gunite companies knew was that most fiberglass companies did not have diving pools, so they could use that to help beat out the fiberglass sales guy. But it did not take long before fiberglass manufacturers started building fiberglass swimming pools that were 8’ deep and could take a diving board. The purchase of a swimming pool is a huge investment. Buying a pool is not like buying a car; it is more like adding on an addition to your home. Most people purchase their first car before they are 18 years old and they do so with the help of a family member. During your lifetime you will purchase many cars where on the other hand you will probably only purchase one pool. Also when purchasing a car you can get quite a bit of advice from quite a few people, because almost everyone you know has owned more than one car. The same is not true with a pool. Even when talking with someone who has had or has a pool does not guarantee good advice, because that person has probably only owned one pool, which means that their knowledge is limited to just that. We have already discussed automatic pool covers in another blog article that discusses all covers, but this past year I have had many requests for automatic pool covers and mostly I have found that those people have not read our article on pool covers. Is Any Backyard Too Challenging for a Fiberglass Pool? Epic Video! When I first walked into the backyard of Chuck and Kristian Todd in Arlington, Virginia, my first thought was, "If this is going to happen, it'll have to be interesting." In the end, it turned out to be quite interesting indeed, as you'll see in the following before and after video. Although this photo might confuse you at first, it's showing a fiberglass display pool at our headquarters here in Warsaw, VA, after some serious wind gusts that have been plaguing the state over the last couple of days. What normally is a pool shell on its side with the trailer as its base, mother nature decided to blow it over with some serious force behind it, causing the shell to slam to the ground. Even better though, the shell was unharmed. Its flexibility and tensile strength, as always, saved the day. In the past, we at River Pools and Spas have taken the time to recognize the different advances and developments in the fiberglass pool industry over the years, many of which have been the most read articles on this blog to date. So as 2013 is now here, we felt it time to discuss the best inground fiberglass swimming pool designs we’re seeing in terms of functionality and creativity in 2013. Also, as a side note, this article is not about the quality of the included manufacturers, but rather our opinions on their designs. Here goes! Fiberglass Pool Pricing in 2013 and Beyond: Where is the Industry Headed? We’ve talked extensively about the cost of fiberglass pools here on this blog over the years but as 2013 approaches, I wanted to take a look at where pricing is headed in this industry and what it means for consumers and pool builders as a whole. What Are the Best and Worst Types of Swimming Pools and Why? Well, you’re in the market for a swimming pool. Congratulations! Yes, I know, you may be thinking a pool is going to be a lot of work. But these days, it clearly doesn’t have to be, especially if you choose a few options that will make pool ownership much, much easier. In order to help you find the type of pool that will best suit your needs, here are some helpful tips. What Are the Biggest and Smallest Sizes for Fiberglass Pools? With the prolific growth of the fiberglass pool marketing over the last 10 years here in the United States, consumers are getting more and more options, sizes, and accessories to choose with their fiberglass swimming pool. This being said, the size of fiberglass pools will always have some limitations due to the fact that they are built offsite in a factory and then shipped on highways. With most wide-load laws preventing anything to travel on the highway that is more than 16’ wide, this can make it very difficult to produce anything of a greater size. Well it's that time of year folks. August is here, vacations are being taken left and right, the heat is on, and for some pool owners, this all can equate to that green thing that makes pool ownership a frustrating experience—Algae. Rarely do we ever toot our own horn here on this blog, but recently Pool and Spa News—the swimming pool industry's premier publication—ranked River Pools as a top 50 builder in the United States. As someone who closely watches swimming pool research buying and traffic pattern from an internet marketing perspective, this last week has blown me away in terms of the amount of people online right now researching swimming pools, much of which can be attributed to this incredible heat wave we've been feeling throughout the U.S. and certainly on the east coast. In fact , to get a true feel of just how much heat affects the way people research swimming pools, take a look at the following screen shot, which shows the amount of traffic we've been getting these last 2 weeks here at the River Pools website. Well, it appears every 6 months I'm going to be writing an article about how Viking Pools has decided to purchase another fiberglass pool manufacturer, with Royal Fiberglass Pools being the next small company to hand over its keys to the industry giant. After having been heavily involved in the swimming pool industry for the past 10+ years, it has been interesting for me to watch the changes that have occurred in the industry, as well as the trends that seem to be taking shape daily, especially when it comes to preformed fiberglass swimming pools. When it comes down to it, every type of inground swimming pool has its share of problems. Vinyl liner pools are very temporary, fiberglass pools have size/depth restrictions, and concrete pools have their drawbacks as well. In this article, though, I’m going to point out some problems with concrete pools you may not have considered before. These are things you should clearly know before moving forward with your inground pool purchase. Let’s face it; many folks just don’t have a flat yard. If you fall into that category and are interested in an inground pool, you are probably asking yourself the following questions: What options do I have for installing a pool in my yard? What will the project look like when completed? How much will it cost? Ultimate Fiberglass Pool vs Vinyl Liner Pool Video! In the following video you’ll see an existing vinyl liner pool that we converted to fiberglass. The most amazing aspect of this entire project is that the dilapidated vinyl pool you're about to see is only 15 years old…and it’s already gone through 3 liners! If you are considering the purchase of an inground pool, you're already researching how much the pool will cost upfront. It's important! However, you’re probably also wondering what maintenance and repair costs you can expect to encounter as the years pass on. As you’ll see, the answer to that question largely depends on the type of pool you choose: concrete, vinyl, or fiberglass. Last week, I opened my swimming pool up for the season and was surprised to find the results-- it was green...REALLY GREEN. When someone is considering the purchase of an inground swimming pool, there are many factors that will dictate whether they choose fiberglass, concrete, or vinyl liner. And although each type of pool has its own pros and cons, this article will discuss 5 main benefits to owning an inground fiberglass swimming pool.